Escape to the middle east and soak up all the spectacular sights of Dubai, where you’ll find unforgettable architecture and luxury hospitality. Mesmerising golden beaches, wondrous nightlife and astonishing desert terrain. Dubai is a special city that quite simply cannot be overlooked, because it’s a city packed with adventure to facilitate all varieties of honeymoon. Retreat into an oasis of bliss and let your romance flourish in one of the Middle East’s most iconic cities. Let lush green hills, turquoise seas and sugar-white sands be the backdrop for your multi-centre honeymoon. Hotels in Bali are the ultimate in easy chic, with stylish and serene interiors fully equipped for a week of unwinding on the beach, by the pool, or exploring your surroundings. With a fascinating local culture and an unrivalled natural beauty, there’s plenty more to discover on a Bali honeymoon once you’re fully refreshed. Below is an example itinerary. For a tailor made Dubai and Bali honeymoon multi-centre call 0121 440 6268. 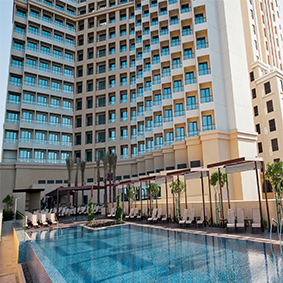 For stylish but comfortable luxury accommodation on Dubai’s exclusive JBR Walk beachfront promenade, look no further than the JA Ocean View Hotel. Offering sweeping views of the Arabian Gulf – hence its name – as well as delectable fine dining and outstanding leisure facilities, this chic modern hotel is sure to give you the Dubai honeymoon you have always wanted. Savour the Dubai honeymoon of your dreams in luxury and comfort when you choose JA Ocean View Hotel as your accommodation of choice. Tucked away amid the verdant hillsides of Ubud and facing out over a series of breath-taking emerald rice terraces, Ubud Village Resort and Spa promises honeymooners a little taste of manmade paradise surrounded by the splendours of nature. 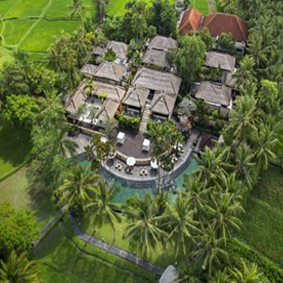 With its lush gardens, stately coconut palms and lotus ponds, not to mention its inviting traditional décor, this luxury Ubud resort is sure to take your breath away with its grace and beauty. If that wasn’t enough to captivate you, Ubud Village also offers lavish accommodation, delectable wining and dining, soothing spa treatments, and the opportunity to try an exciting variety of interactive classes and adventurous activities. Tucked away among lush tropical foliage within easy reach of the beach and the bustling heart of Seminyak, you will find The Elysian Seminyak getaway, a luxury retreat which offers elegant all-villa accommodation guaranteed to make you feel right at home in paradise. Spend a blissful honeymoon comfortably ensconced in your one-bedroom pool villa and enjoy days of unforgettable sightseeing and indulgent delights including pampering spa treatments, delicious dining and hours of relaxation in one of the resort’s private poolside cabanas.